Our Readers' Cafē is the time every Friday morning when we get together with our peers to share our personal reading books for the week. We have had 17 sessions so far in 2017 and as we are nearly half way through the year, this seems like a good time to reflect on how we are doing, how we can improve the systems we have and set some important goals for ourselves. In essence, Readers' Cafē is run by the students. 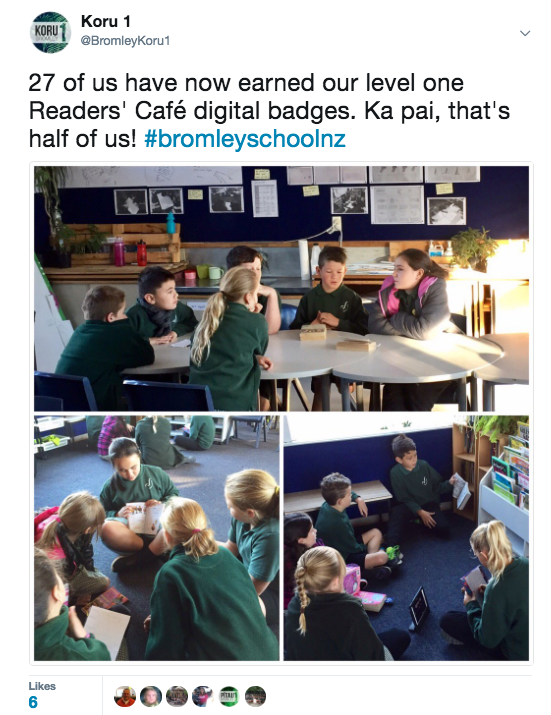 They choose their own books for personal reading, they organise themselves to read at school and at home (getting signed off by a parent or guardian) and they run the Friday morning sharing sessions. During a Reader's Cafē session, students are organised into groups of 4-6 (usually decided by how many times they have won Readers' Cafe). One person is the observer. They facilitate the session by keeping each person to a time limit when sharing their book/s. They are also responsible for awarding points to group members for how well they share their books (max 3 points) and how well they listen and ask questions of others (max 2 points). At the end of every session, the observer announces the winner, who then becomes an observer the following week. 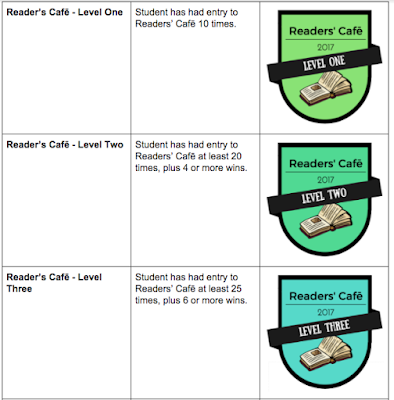 Something new we have introduced this year are digital badges for Readers' Cafē. These are proving to be motivating for students, with many already having earned the Level One badge. Students are displaying all of the digital badges they are earning (as their are badges for other achievements too) on their individual blogs. Class survey data from this week shows how we feel we have been going in regards to Readers' Cafē and our effort. This is interesting information we have gathered for class discussions. In particular for those who have not marked 4 or 5 for this question, we will be asking why this is the case. Is it too difficult? Is it not accessible to all students? Do we need to change any of our systems around Readers' Cafē? Or... Is this a good result and a sign that the system works well as a core routine in Koru 1? Also, what effect does Readers' Cafē have on us as readers? Keep an eye on our individual blogs this week, as we are all writing a reflective post about some of our memorable personal reading books from this year to date! I already have my 1st badge but i think i will be one of the only people to get level 2. Because you would have to be in readers cafe 20 times and have been observer 4 times.at the end of the term I will have my level 2 badge! I almost have my level 2 badge. I just need one more win.